Patti LuPone, host and narrator of Treasures of New York: Lincoln Center, is a proud graduate of the first class of Juilliard’s Drama Division. She has appeared on THIRTEEN in Great Performances, Live From Lincoln Center, and other performing arts series. 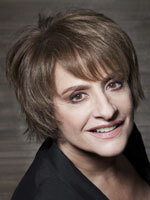 LuPone spoke with THIRTEEN about her relationship with Lincoln Center and public television. When you heard about Treasures of New York: Lincoln Center, what made you want to participate in the film? I was honored to be asked. Lincoln Center has played an incredibly important role in my career. You have a long, productive relationship with Lincoln Center, from your time as a Juilliard student to your many Lincoln Center productions. What are some of your favorite Lincoln Center memories? Twelfth Night with Blythe Danner at the Beaumont, Ellis Rabb’s production of The Merchant of Venice with Rosemary Harris and Christopher Walken, singing “Sweeney Todd” with the NY Philharmonic and subsequent performances with them, watching the New York City Ballet at the State Theater and my second opera, The Magic Flute, at the new Metropolitan Opera House, and finally, making my Lincoln Center debut in Anything Goes at the Vivian Beaumont Theater. You made your television debut on THIRTEEN in 1976 in The Time of Your Life and have starred in many public television programs since then. Why is public television important in 2011? Because it makes the arts available to a wide audience. Because the arts are a priority on public television, not reality TV. Do you recall the first public television program you ever watched, or a program that was particularly memorable or inspiring? Alistair Cooke hosting Masterpiece Theatre. Name something New York City has that no other city offers. The New York Yankees and the Macy’s Thanksgiving Day Parade. Major support for Treasures of New York: Lincoln Center with Patti LuPone is provided by Rosalind P. Walter, Cheryl and Philip Milstein Family, and the Metropolitan Media Fund.